Down to Earth Vegan Kitchen features 100-percent plant-based Mexican fare on the UT Arlington campus. Above, Spicy Sweet Potato and Beans Taco and Napolitos Taco. Photo by Andrew Ridout. Arlington now offers a new vegan dining option with a Mexican flair with the launch of Down to Earth Vegan Kitchen on the northeast side of the University of Texas at Arlington campus. 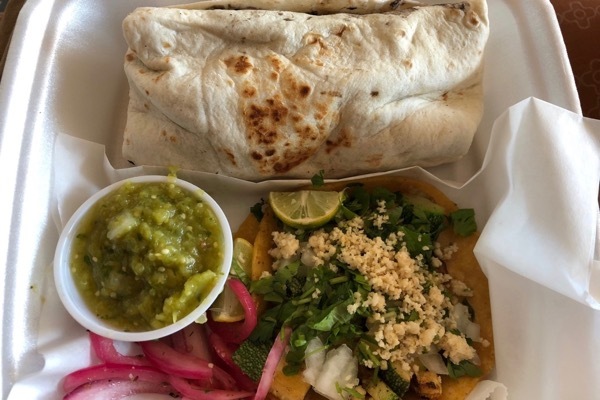 Although the brick and mortar cafe has only been open a few weeks, owner Alma Rangel has operated a vegetarian food truck since 2014. Rangel, who has been vegetarian since 2013, made the switch to veganism in 2018. She admits that it was a challenge. "In those five years, my biggest obstacle was saying goodbye to cheese. I wasn't eating eggs or drinking cow milk but cheese was my Achilles heel. What finally made it happen is that I started experimenting with making my own vegan cheeses. After that, it's been a breeze." 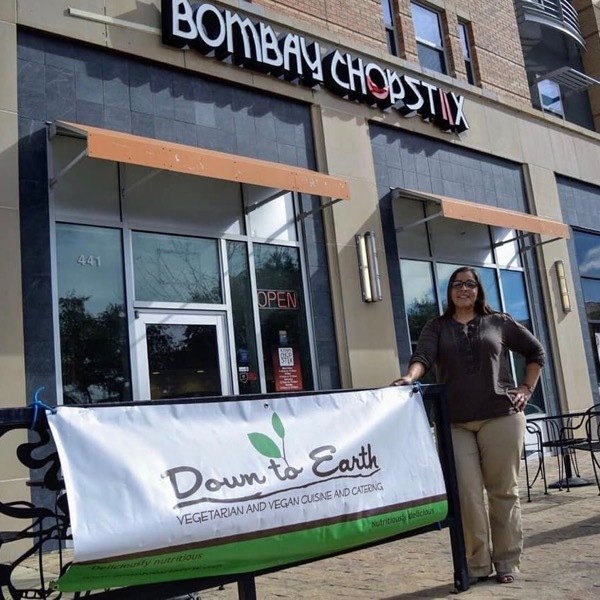 Alma Rangel of Down to Earth Vegan Kitchen shares space with Bombay Chopstix. Photo courtesy of Alma Rangel. She has incorporated a Mexican cocotija vegan cheese into many of the items on the menu in her new digs, which she shares with Bombay Chopstix. She befriended the owners while operating her food truck business. The UTA location has been a welcome addition to campus for students like me. As a UTA senior and a vegan, I have often been frustrated by the lack of veg-friendly eateries on campus. So when I read of Down to Earth's opening in a social media post, I was thrilled to try their south-of-the-border fare. So far, my favorite menu items have been the Spicy Sweet Potato Tacos with black beans, diced onion, cilantro and vegan cheese and the uber-authentic Grilled Nopalitos Cactus Tacos with diced onion, cilantro and vegan cheese, both $3 each. I also enjoyed Bean & Cheese Molletes on toasted bolillo bread with soyrizo black beans, pico de gallo and vegan cheese. Most of their items come with a delicious zesty tomatillo salsa. Their grilled corn Elote En Vaso ($5) also looks appetizing as well as their drinks which include a Hibiscus Limeade ($4) and a spicy Mexican coffee (Café de Olla) with cinnamon, cloves and piloncillo brown sugar ($3). Although I haven't had a chance to try everything, I look forward to working my way through the entire menu during the semester. “The reception has been tremendous. We feel the love every day from students, faculty, and campus staff," she admits with a smile. The restaurant has been so successful that Alma is planning to add more popular items, based on customer feedback. And her food truck business will keep rolling, incorporating her Mexi-vegan options. "We're listening!" says Rangel. "I'm getting lots of requests from our food truck followers for our chipotle black bean burger, our 4-bean chili, and our hibiscus blossom tacos." Looks like I’ll be spending more of my lunchtime at Down to Earth. Breakfast Is All Day Burrito and Calabacitas Taco. Photo by Andrew Ridout. About: 100 percent plant-based cafe created by Alma Rangel, owner of the Down to Earth food truck, featuring vegan Mexican fare. Where: 441 Spaniolo Drive, off UTA Blvd on the UTA campus. Andrew Ridout is a software engineering student at the University of Texas at Arlington currently living in Dallas. He has written articles for The Daily Texan newspaper and numerous other personal essays both for school and work. He is a strong advocate of a wholly plant-based diet. Contact him at fridout106@gmail.com.